"Queensway Bay" Back On Front Burner: CA Supreme Court Dismisses City Hall Effort To Overturn Ruling Nixing State Agency Approval of Queensway Bay "Land Swap"
(January 7, 2006) -- The development originally called the "Queensway Bay Entertainment/Commercial" project, subsequently renamed the "Pike @ Rainbow Harbor," may become a hot button issue again in Long Beach and Sacramento. On January 4, 2006 the CA Supreme Court gave a legal victory to local environmentalist Don May and the statewide group he heads, CA Earth Corps, by dismissing a LB City Hall effort to overturn a Court of Appeal ruling invalidating a state agency's approval of a 2001 tidelands trust exchange ("land swap") arranged by LB City Hall to facilitate the Queensway Bay project. The polarizing nature of what many agreed at the time would be LB's defining shoreline development is documented below in flashback photos and text...along with salient parts of an August 2001 interview with former LB Councilman, then-Assemblyman, now State Senator Alan Lowenthal whom we asked at the time about the then-pending "land swap" (subsequently approved by the Council and State Lands Commission). In April 2005, as a result of the appeal pursued by CA Earth Corps, the Court of Appeal ruled that State Lands Commission's approval of the land swap was not supported by the evidence. LB City Hall then appealed...and the CA Supreme Court has now dismissed City Hall's appeal, leaving CA Earth Corps with its Appeal court victory. 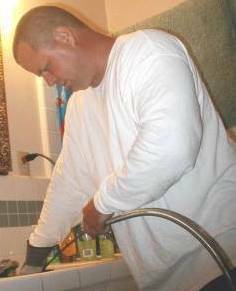 "In light of the recent amendment of Public Resources Code section 6307...review of the [CA Earth Corps. vs. State Lands Comm'n, et al.] matter is dismissed," the Supreme Court said. The state legislation cited by the High Court flew through Sacramento in Sept. 2005 using a procedure termed "gut and amend" in which language from an unrelated bill is stripped away and new language is substituted that avoids usual hearings and debate. State Senator Denise Ducheny (D., SD) used the "gut and amend" procedure with SB 365 to give the State Lands Commission the power to approve land swaps of the type opposed by CA Earth Corps and invalidated by the Court of Appeal. The "gut and amend" bill passed with the "yes" votes of Assemblymembers Betty Karnette (D., LB), Jenny Oropeza (D., LB-Carson) and state Senator Alan Lowenthal (D., LB-SP-PV). Mr. May told LBReport.com that CA Earth Corps -- and a number of other CA organizations -- plan to make reversal of the 2005 "gut and amend" tidelands bill one of their top priorities in the coming months. "CA Earth Corps is not alone in our concern over what took place and how it took place," Mr. May said. Meanwhile, the Supreme Court dismissal leaves the Appeals court decision unpublished but intact, apparently sending the issue back to the State Lands Commission. Mr. May said CA Earth Corps will be at the State Lands Commission's February meeting to press for removal of non-tidelands trust uses from the development...a category he says includes a soon to open "Borders" bookstore. "In our view, bookstores aren't tidelands trust uses and don't belong in a tidelands development," Mr. May told LBReport.com. 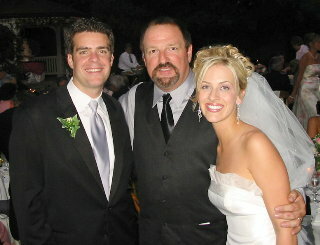 In September 2001, the State Lands Commission (comprised of the Lt. Governor, the State Controller and the Governor's Director of Finance) approved giving up state tidelands designation on certain commercial footprints within the QW Bay tidelands areas in exchange for the state receiving from the City of LB various parcels along the L.A. river and a freeway median that now carry tidelands designation. 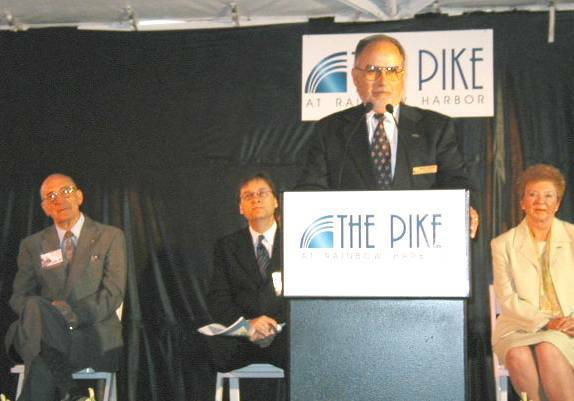 When a trial court (subsequently reversed) upheld officialdom's actions in 2002, then-City Manager Henry Taboada said in a City Hall release, "This [lower court] ruling validates the City's original stance that the Pike at Rainbow Harbor has always been environmentally sound." Mayor Beverly O'Neill declared at the time, "With all the legal issues behind us, we can now move forward with the largest and most vibrant waterfront development in Southern California." The Queensway Bay development is within LB's 2d Council district, previously represented by then-Councilman Alan Lowenthal, now represented by Councilman Dan Baker. CA Earth Corps president May said he appealed the actions by LB City Hall and the State Lands Commission on principle. "I felt what Long Beach and the State Lands Commission did was terribly wrong and a disservice to the public," Mr. May said. 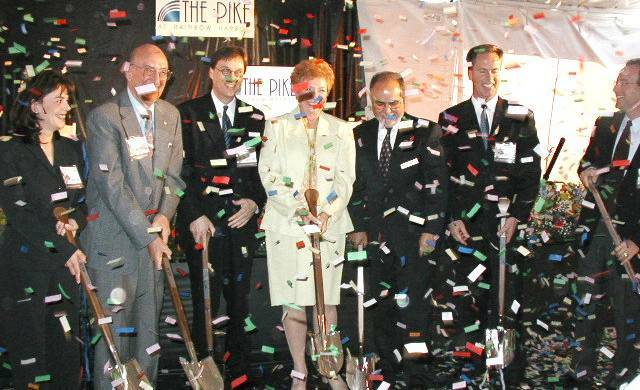 On May 14, 2002, confetti flew, the Mayor beamed and the City Manager and developer DDR's officials were all smiles at a gala kick-off ceremony for construction of the Pike at Rainbow Harbor. Mayor Beverly O'Neill: ...[W]e can now look forward to developing the largest waterfront complex in southern California. It's really a defining moment for the city of Long Beach, because this is the final piece of the puzzle that was initiated ten years ago...And I can remember when I was first Mayor in 1994, [now retired City Manager] Jim Hankla and I would look out the window and say, see that parking lot out there? That's the most desirable piece of property in southern California. And it's going to have something on it that's going to make us all proud. [P]eople would say, why do we need all these hotels on Ocean Blvd.? Well, that's because the Convention Center wasn't finished. Now we need more hotels. So it takes a lot of time to put all this together. So no other community in southern California can offer the combination of venues that will be located here. And once the Pike at Rainbow Harbor is completed, Carnival Cruises will be here attracting thousands of people to the city. People will have an opportunity to visit this Pike, the Queen Mary, the Aquarium of the Pacific and many of our outstanding restaurants that we have right around here. So with the new developments going on from the downtown, and CityPlace under construction, that also is a DDR project, our community is going under a massive revitalization that will change our landscape really forever. Long Beach will never be the city it was twenty years ago. But cities should not stand still. If they stand still, they fall behind and Long Beach is moving ahead like no other community in California. City Manager Henry Taboada: ...My task this morning is to thank all of the folks who have had so much to do with this project, and to share with you my joy, and my gratitude, for all that has happened and for all that is about to happen. Like a tale of two cities, it was either the best of times or the worst of times. [M]edia outlets were sent a City Hall press release quoting Mayor O'Neill as follows, "This is a momentous occasion. It will be a pleasure to watch the Pike at Rainbow Harbor unfold during the development stage. I anticipate seeing both residents and visitors enjoying the Pike at Rainbow Harbor when it opens in 2003. Carnival Cruises, which will be taking its place next to the Queen Mary shortly, the Queen Mary, the Aquarium of the Pacific, Shoreline Village, the Long Beach Convention Center, Pine Ave. and CityPlace -- all will be connected by the Pike at Rainbow Harbor. No other community in Southern California can offer the combination of venues that will be located on our waterfront once the Pike is complete." 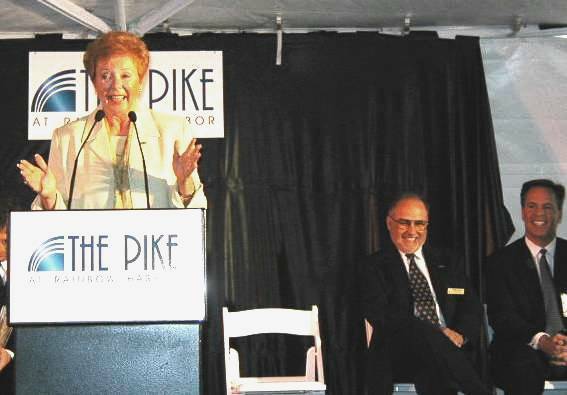 City Manager Henry Taboada was quoted as saying: "Mayor Beverly O'Neill and members of the City Council are to be praised for their continued support of the Pike at Rainbow Harbor. Now that all of the approvals are in place, the City will proceed immediately to a close-of-escrow on the ground lease that will allow DDR to begin construction of the long-awaited 370,000 square foot development. 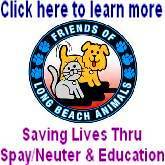 Today is a truly significant day for Long Beach." 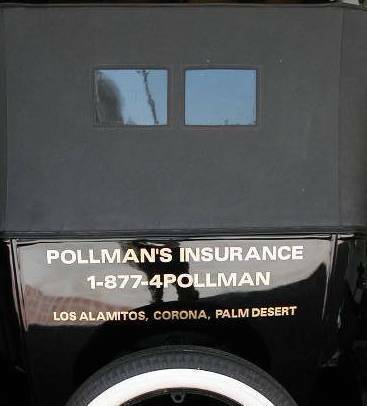 Assemblyman Lowenthal: ...[S]waps have occurred before, San Diego being the most recent swap. And there's no inherent reason for the state to be against swaps if in fact the state's best interests are served by protection of land. But that's just on the generic question about swaps that has not to do with the specifics of this swap. However, even if it is legal, I'm not sure that I would support the project, and that's a personal and not a legal position." What about his position as a legislator? Assemblyman Lowenthal: After the State Lands Commission acts and after the city has a formal position, which they do not, then I will determine what role the legislature should have in this matter. SB 365, Ducheny  Tidelands and submerged lands. trust for navigation and fishing, as specified. public access to the state's waterways. for trust purposes, including commerce, navigation, and fishing. be used more effectively for public trust purposes. SEC. 2. Section 6307 of the Public Resources Code is repealed. will provide a significant benefit to the public trust. rights of navigation and fishing. lands or interests in lands given by the trust in exchange. (6) The exchange is in the best interests of the state. (1) To improve navigation or waterways. (2) To aid in reclamation or flood control. (4) To enhance public access to or along the water. redevelopment for public trust purposes. (7) To resolve boundary or title disputes. in the lands or interests in lands received in exchange. delayed, it is necessary that this act take effect immediately. TOPIC:	Tidelands and submerged lands.